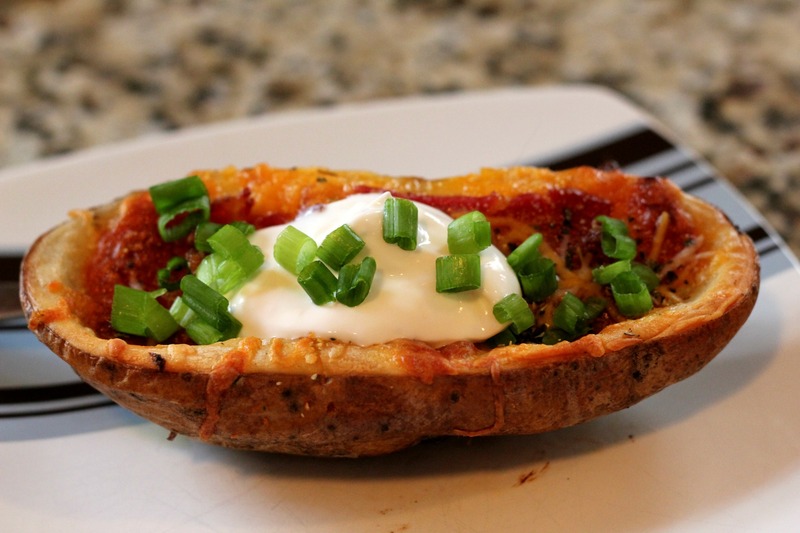 I love loaded potato skins. The combo of cheese, bacon, and potato is one that really can’t be beat. These are a classic, American appetizer enjoyed at bars and burger joints everywhere. Sadly, I usually refrain from eating them because, let’s face it, they’re not exactly a paragon of healthiness. However, on a lazy Saturday of watching college football, I decided to treat myself! And they were a treat indeed…these were SO SO GOOD! Perfect for eating on our TV trays while watching SEC football. One thing I like about this recipe is that you can really mix and match ingredients to your liking. For example, my husband’s potato had onions but mine didn’t because I don’t care for them. I dipped mine in ranch while he topped his with sour cream. You could add diced jalapenos, green peppers, various spices, and any number of ingredients to make these perfect for you. I will post the recipe for the way I made them, but just know that you can be creative with it! Also, a quick tip about scooping out the potato from the skins: The recipe says to do it before you cook them. This is fairly difficult to do. I actually had my husband do it, and he used a knife and spoon to get it done. If you have a grapefruit spoon or something like that, it’d be easier. Or you might just want to bake your potatoes a bit first until they’re slightly more tender, then put in the toppings and cook longer until totally done. Cut potatoes in half and scoop out the insides, leaving about 1/2 inch of potato inside the skin. Place potatoes on a greased baking pan. Bake for one hour. Test the potatoes with a fork to make sure they are tender. When they are done, sprinkle herbs on top. Cover with a little extra cheese. Top with sour cream and scallions. Thank you! We LOVED them! These look absolutely scrumptious, my kind of food ! things. Would be fun to have a verity on a big platter. Thank you so much! And yes, these would be fabulous appetizers for a big group of people. 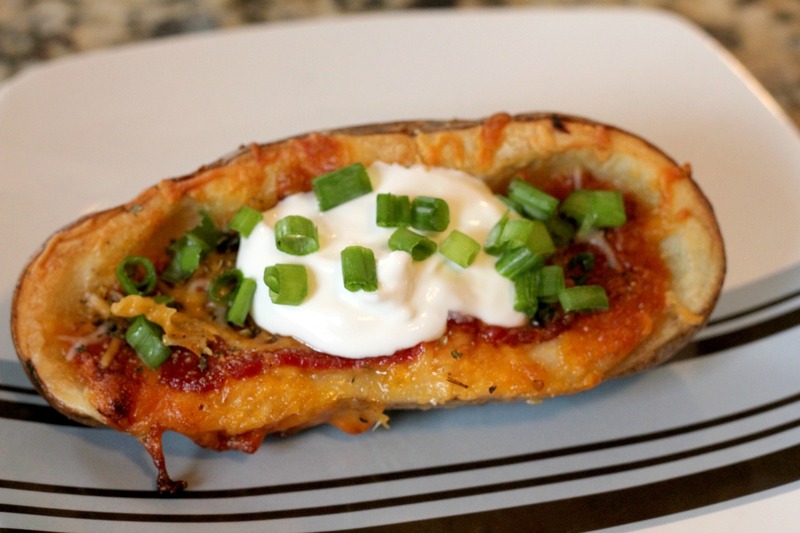 Delicious loaded potato skins! Something I haven’t had in awhile. Thank you for the beautiful reminder! My pleasure! They really are a classic, and we loved them!